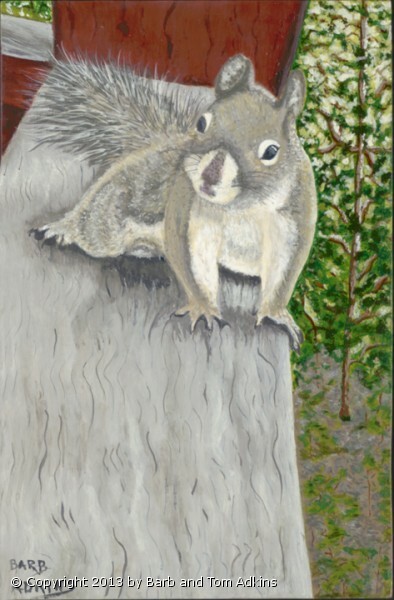 Mr. Grey, as I call him, is really a Western Red Squirrel or Pine Squirrel or Western Phase of the Eastern Red Squirrel. They have a lot of brown in their fur at different times of the year. This guy was 98% gray. He was on our upper deck rail, and had gotten a drink from the fountain. He was on his way back to the other side of the deck and I was standing at the rail, in his way. He was not moving just because I was standing right there 2 foot in front of him. He let me take a close up picture of him. This was so up close and personal I had to paint him. Sometimes these guys make more noise than the big brown fox squirrels also in our yard. These guys are the busiest, fastest little guys around. They seem to feel their small size is of little concern as such important members of the community. "Bark, Bark, Bark, Chatter, Chatter! I am here and don't you forget it." Up and down the trees, jumping across from one branch to another. Quick! "Go this way. No, that way. Follow me. Hurry up! Hey, I'm over here now." Soooo Cute, and always demanding. I have seen Mr. Gray challenge and charge 4 very large Black Ravens on that rail and chase them off, just so he could get his one piece of bread. I really don't think those Ravens excepted him to be brave enough to challenge them. 4.75" x 7.5" x 7/8"
The 7/8" edge of this painting is painted as a Gallery Edge, painted to match and compliment the picture. It may be framed or hung on the wall as is. It may also be framed in a silhouette frame that will show off the Gallery edge painting. I like to paint the edges as part of the picture to give you a choice of how to hang it. When you are coming into a room or down a hall the effect is to give a color visual of something to see that is different or unexpected, rather than the regular edge of wood frame. Giclee Prints printed on Torchon Archival paper or Canvas. Please call for sizes and Pricing. Size: Silhouette Framed 13.5" x 16.5"